OXFAM GRABBED headlines on Monday with a report claiming that the world's eight richest men own as much wealth as the world's poorest 3.7 billion people — half of the planet's population. The report was released in Davos, Switzerland, at the start of the World Economic Forum, an annual powwow of high-powered business and political leaders. The executive director of Oxfam International, Winnie Byanyima, seized the occasion to portray the gap between the world's superrich few and extremely poor many as a moral and social calamity. "It is obscene for so much wealth to be held in the hands of so few when 1 in 10 people survive on less than $2 a day," she said. "Inequality is trapping hundreds of millions in poverty; it is fracturing our societies and undermining democracy." Oxfam's proposed solutions are the usual leftist nostrums: higher taxes, a "living wage" for employees, more government spending. Headlines notwithstanding, Oxfam's "new" finding is the same-old, same-old it trots out every year. In 2014, Oxfam reported that the world's 85 richest people have as much wealth as the 3.5 billion poorest; in 2015, it shaved the number of multibillionaires to 80; in 2016, the number dropped again, to 62. Now Oxfam claims the world's poorest half is out-owned by just eight men. To be sure, it's a striking statistic. It's also irrelevant. 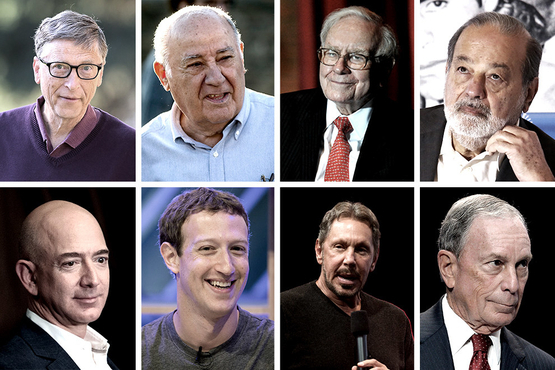 The eight superbillionaires singled out by Oxfam are Microsoft founder Bill Gates, investor Warren Buffett, Mexican telecom mogul Carlos Slim, Facebook CEO Mark Zuckerberg, Spanish clothing magnate Amancio Ortega, Amazon creator Jeff Bezos, Oracle co-founder Larry Ellison, and Michael Bloomberg, the financial-services entrepreneur and former New York mayor. Besides being unimaginably rich, the eight men have a few things in common that Oxfam doesn't dwell on. To begin with, all eight men earned their extraordinary wealth. Through ingenuity, talent, and immense effort, they created enterprises that provide hundreds of millions, even billions, of human beings with goods and services that make life better, healthier, safer, and more affordable. Moreover, the Oxfam Eight didn't grow their fortunes by preventing other people from growing theirs. 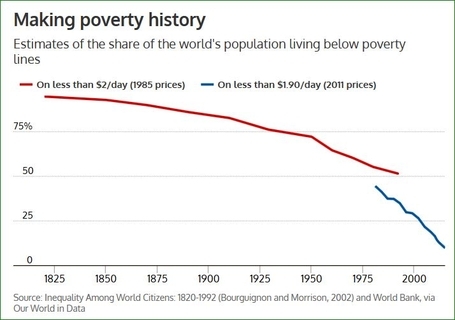 Their wealth may equal that of half the people on Earth (though Oxfam's methodology is dubious), but the world's poor have been climbing out of poverty at the fastest rate in human history. Byanyima rightly bewails the fact that "1 in 10 people survive on less than $2 a day" — what she omits is that over the past 30 years, the number of people living in such extreme poverty has fallen by nearly 75 percent. Johan Norberg, writing in Spiked Review, provides hard numbers: Worldwide, an average of 138,000 people climb out of extreme poverty every day. Since 1990, the world's population has grown by more than 2 billion, yet the ranks of those in extreme poverty has shrunk by more than 1.25 billion. It is, in Norberg's words, "the most important story of our time: Poverty as we know it is disappearing from our planet." Just as capitalism made it possible for Gates, Zuckerberg, and the others to reach the highest rung on the economic ladder, it is making it possible for billions of men and women to climb up from the lowest rung. Oxfam's billionaires are richer than they used to be. So is almost everyone else. Since 1990, the world's population has grown by more than 2 billion, yet the number of people in extreme poverty has shrunk by more than 1.25 billion. The populist left is forever railing against wealth and those who earn it. Jeremy Corbyn, the British Labor Party chief, last week suggested the imposition of a maximum-wage law that would put a ceiling on the amount of money Britons can earn. But tearing down the rich has never yet succeeded in raising up the poor. Of course, the super-wealthy ought to share their great fortunes. Not because wealth disparities are "obscene," as Oxfam says. And not because the economy is a zero-sum game, with the rich getting richer only as the poor get poorer. But as a matter of goodness and gratitude — the timeless moral principle that from those to whom much is given, much is required. Oxfam's megabillionaires agree. They have all given vast amounts to charity, using their wealth to do good for enormous numbers of people in need, in danger, or in pain. Gates has donated more to charitable causes than anyone, ever. Buffett and Zuckerberg have pledged to give away more than half of their wealth to philanthropy, as have scores of other billionaires. Wealth is good, and the more people who can create and earn it, the better. All decent people should worry about what the very poor lack. If you obsess instead about what the very rich have, you're doing it wrong.